Update 9/19/18: The LPC approved Howard Hughes’ and David Rockwell’s proposal. It might still be steamy outside, but the colder months are upon us, and this year, NYC will have a brand new ice skating rink. 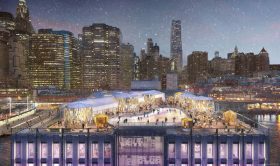 CityRealty uncovered renderings that show how the Howard Hughes Corporation would like to transform the South Street Seaport’s Pier 17–the SHoP Architects-designed food/drink, retail, and entertainment complex–into a rooftop winter village. The proposal by David Rockwell Group calls for an ice rink just slightly smaller than that at Rockefeller Center, a skate shop, and a warming hut. The team is presenting the plan to the Landmarks Preservation Commission (Pier 17 is part of the South Street Seaport Historic District) this afternoon, so check back for updates on the vote. Howard Hughes Corporation’s re-launch of the SHoP Architects-designed Pier 17 in Lower Manhattan’s Seaport District kicked off this summer, with exciting plans for food, drink, art, architecture, retail, and entertainment concepts finally being realized. The first two venues in the new complex–the Heineken Riverdeck waterfront bar, designed by Woods Bagot, and the Fresh Market Hall restaurant–are open for business and the district’s 2018 rooftop concert series officially began on July 28 with a free opening-day performance by Jon Batiste and the Dap-Kings. The rest of the new complex in what historically was the city’s first 24-hour district is still under construction, but designs are taking shape on the way to transforming the existing building into a vibrant destination and a 21st century 24/7 live/work/play community. A rendering of Pier 17’s proposed temporary rooftop structure via LPC/ Howard Hughes Corp. The Howard Hughes Corporation has worked since 2010 to revitalize the Seaport District as a destination for New Yorkers, bringing more than 400,000 square feet of cultural and culinary space to the waterfront. The highlight of the $731 million redevelopment remains Pier 17, a four-story building designed by Achim Menges with a see-through canopy, dining options, an iPic theater, retail and more. The Landmarks Preservation Commission approved the revised designs for the project in December and the New York Post has just learned more information about the project’s timeline, with nearly everything set to open at some point this year. 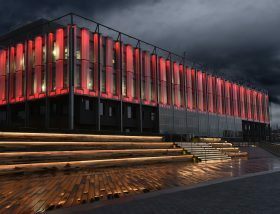 Pier 17 glows red in honor of new tenant ESPN. Photo: Taylor Crothers via Howard Hughes Corporation. Cable giant ESPN will be opening a big new studio–the sports network’s first in NYC–this spring at the South Street Seaport Pier 17 complex in Howard Hughes Corporation’s $731 million East River waterfront redevelopment project. 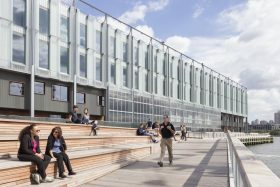 The New York Post reports that the network’s studio partner, NEP group, has signed a multi-year lease for a 19,000-square-foot third floor space with Brooklyn and Manhattan skyline views at the new pier.